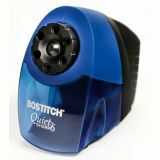 Built with the classroom demands in mind, this sharpener will help students sharpen their pencils quickly, quietly, and safely. The XHC cutter technology allows for 70% faster sharpening and 10x longer life. With the combination of a QuietSharp super duty motor and thermal overload protection, operation is quiet with the durability to withstand strenuous classroom use. To ensure safety in the classroom, the tamper proof MagnaSafe shutoff technology smartly prevents operation when the shavings tray is removed. The kid friendly, easy turn 6-size selector dial will accommodate the various pencil sizes used in schools. And for ease of use, the Tip Saver Technology prevents over sharpening, extending pencil life. This sharpener is the perfect addition to any classroom! 7 year limited warranty.